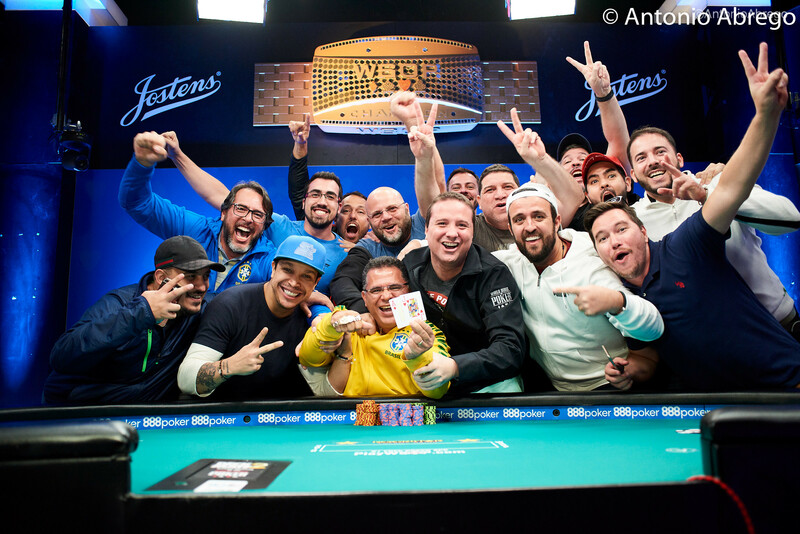 Roberly Felicio Wins the 2018 WSOP COLOSSUS for $1,000,000! After playing 243 hands today, Roberly Felicio finally managed to clinch the win in the end by defeating Sang Liu heads-up in Event #7: $565 COLOSSUS No-Limit Hold’em. 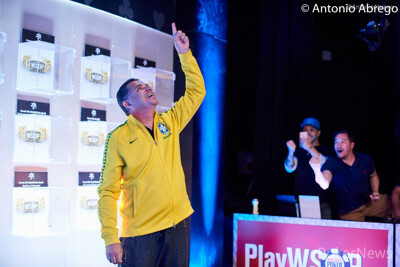 Not only did he win the fifth coveted gold WSOP bracelet for Brazil, he also took home $1,000,000 for his efforts over the past days. Over six starting days, 13,070 hopefuls took their seats, creating a total prize pool of $6,535,000. Just after he had his winner photo taken, Felicio said: "I’m very happy, it was a tough final table with tough opponents. Heads-up was very emotional. But I’m very excited to take home my first bracelet, I still can’t believe it." First to the rail in ninth place was Steven Jones, who started the final table as the short stack. He ran his ace-deuce into the jack-seven of Song Choe in the fifth hand of the day. Choe flopped two pair to take Jones out of the running. Fifteen hands later, it was John Racener’s turn to say goodbye when he ran his ace-jack into the pocket sevens of Choe. The hand right after that, Gunther Dumsky had to leave the stage when he shoved all in on the turn with pocket eights on a six-four-three-king board. Again, it was Choe to take care of business as he called with king-jack for top pair to eliminate Dumsky. However, Choe was about to lose most of those chips when he doubled up Scott Margereson. Choe had flopped a set of jacks, but Margereson rivered a straight to scoop a big pot. 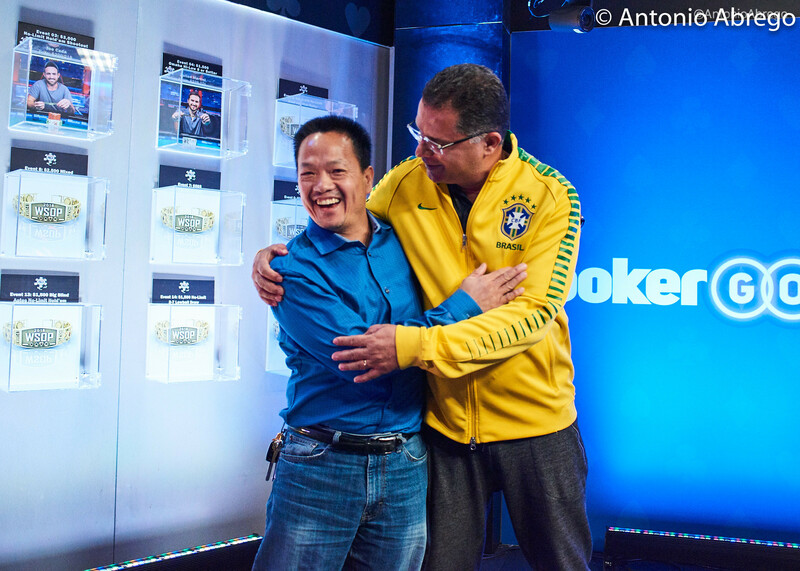 Choe left the stage in sixth place when he found ace-seven and called when Timothy Miles put him all-in with pocket eights. 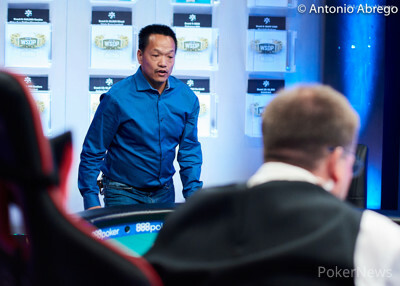 The board didn’t help in any way and Choe got to take home $126,158 for his efforts. With five players left, Margereson made a monster laydown against Miles as the stream would later reveal. Holding pocket sixes on a six-queen-king-ace board, it was Miles who check-raised all in after Margereson had bet. Amazingly enough, "Aggro Santos" found a fold with bottom set, and it turned out to be the correct decision as Miles played pocket kings for a higher set. After playing five-handed for almost three hours, next to go was Miles who ran his pocket jacks into the ace-king of Liu. An ace fell on the flop to knock out Miles in fifth. Another long spell without a bustout followed as four-handed play lasted nearly four hours. In hand #192, the curtain finally closed on Margereson, who ran his last nine big blinds with ace-six into the pocket nines of Felicio. Twenty minutes later, Liu got rid of Joel Wurtzel when the latter shoved ace-four into the king-ten of Liu. Liu managed to hit a flush on the turn to leave Wurtzel drawing dead. With Wurtzel's elimination in 3rd place, heads-up play between Felicio and Liu would commence. In the 25th hand of heads-up play, Liu had limped and then snap-called the shove of Felicio with pocket jacks. Felicio held pocket tens but the jacks on the flop gave Liu quads and left Felicio drawing dead, while Liu was dancing around the table. However, the celebration was about to be cut short as the players got their stacks in the middle again in the next hand. Felicio moved all in on a jack-seven-three flop. Liu snap-called again with jack-ten. Felicio was behind, holding jack-eight. However, the Brazilian spiked a crucial eight on the river to give him the double-up he needed to stay in the tournament. Liu grinded his way back up and found a double-up once more before the final hand of the night was dealt. After a limp by Felicio, Liu shoved and Felicio snap-called. 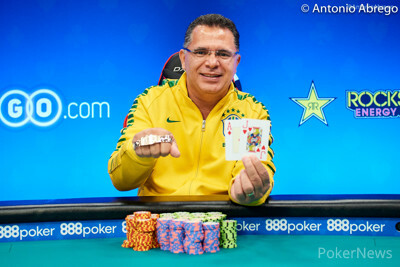 The Brazilian held ace-jack and Liu was behind holding ace-six of spades. The flop gave Liu both flush and straight draws but the turn and river bricked out. The Brazilian rail erupted in cheers and their phones were all out to record this amazing win for their fellow countryman. 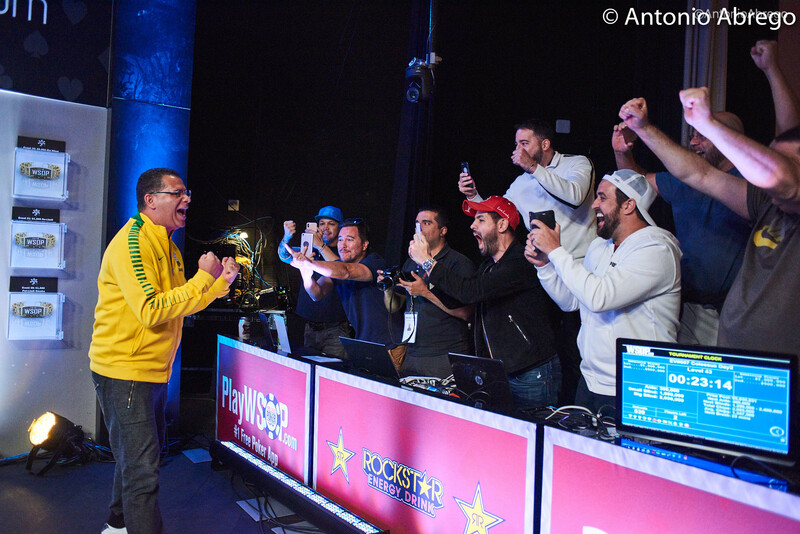 Andre Akkari, Felipe Ramos, and Bruno Politano were some of the Brazilians on his rail. As soon as he was done with the interviews, the whole rail gave him a big hug and Felicio seemed overwhelmed and over the moon with all the attention. This concludes the live reporting for the COLOSSUS for 2018. The PokerNews live reporting team will be here for the whole World Series of Poker so stay tuned for all the updates from the floor! Hand #243: Roberly Felicio limped in and Sang Liu moved all in for 26,900,000. Felicio snap-called and they turned over the cards. The dealer fanned the flop; a monster flop for Liu who picked up both straight and flush draws. Felicio, however, was still in the lead with his jack kicker. "Come on spade or three," Liu shouted just as the hit the turn. 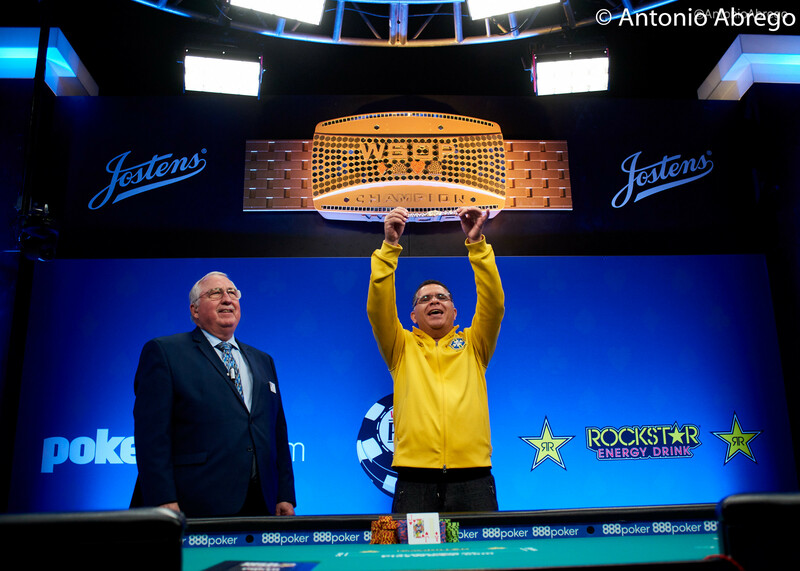 The completed the board and Felicio ran into the arms of his rail as the Brazilian cheers filled the room. The two players shook hands afterwards. Liu earned his largest career tournament cash of $500,000 for his second-place finish in the COLOSSUS. A recap of today's action will follow shortly. Hand #240: Sang Liu limped in and Roberly Felicio checked. The dealer spread the flop and Felicio check-called a bet of 2,200,000 from Liu. The turn was the and both players checked. The river was and Felicio fired out a bet of 6,000,000. Liu folded and Felicio took the pot. Hand #241: Felicio limped in, Liu moved all in and Felicio folded. Hand #242: Liu moved all in for 24,600,000 and Felicio folded. Hand #235: Roberly Felicio raised to 5,000,000 and Sang Liu folded. Hand #236: Liu called and Felicio shoved. Liu folded. Hand #237: Felicio called, Liu shoved and Felicio folded. Hand #238: Liu shoved and Felicio folded. Hand #239: Felicio shoved and Liu folded. Hand #234: Sang Liu shoved for 14,400,000 and Roberly Felicio called. The board ran out to give Liu the double-up. Hand #228: Sang Liu shoved for 7,200,000 and Roberly Felicio folded. Hand #229: Felicio opted to fold. Hand #230: Liu shoved and Felicio folded. Hand #231: Felicio folded again. Hand #232: Lui shoved and Felicio folded once more. Hand #233: Felicio shoved and Lui folded. Hand #227: Roberly Felicio limped in and Sang Liu raised to 5,000,000. Felicio called and they saw a flop of . Liu checked and Felicio moved all in for 23,700,000. Liu snap-called, turning over , and Felicio shook his head tabling . The turn was the and Liu was just one river card away from becoming the Event #7: $565 COLOSSUS No-Limit Hold’em Champion. 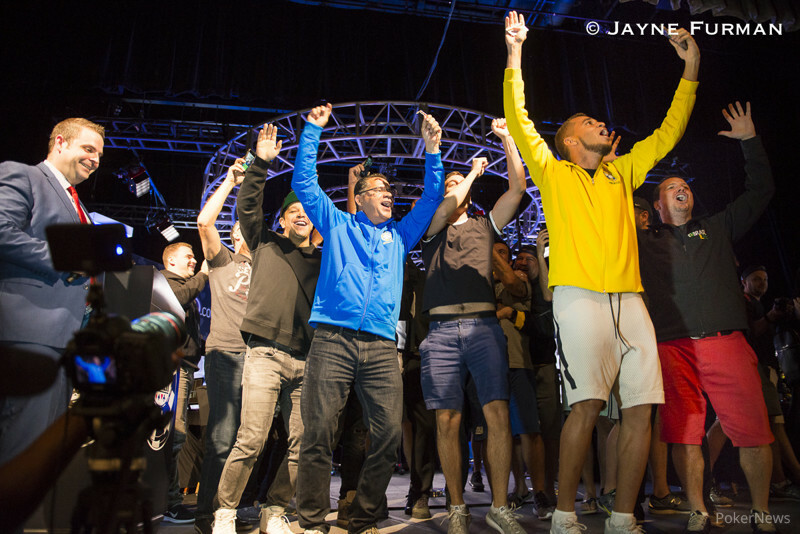 The hit the river and the crowd went wild as Felicio spiked two pair to stay alive and the heads-up battle for the bracelet continued. Hand #226: Sang Liu limped in from the small blind and Roberly Felicio moved all in from the big blind. Liu snap-called for his last 17,900,000, turning over , and Felicio showed . The dealer fanned the flop. Liu flopped quad jacks and burst out in a celebration dancing around the table. "How are you going to beat me now" he joked. The meaningless and completed the board and Liu doubled up. Hand #224: Sang Liu limped in and Roberly Felicio checked. They saw a flop of and Felicio checked to Liu who bet 2,500,000. Felicio check-raised all in and Liu folded. Hand #225: Felicio limped in, Liu moved all in for 14,700,000 and Felicio folded.